If you’re an Xbox One owner and you’ve been looking to get the most mileage out of your system -- but don’t necessarily have the cash to build up a game library right away -- then the Xbox Game Pass is the program for you. This on-demand service goes for $10 a month and gives you access to a number of games from Microsoft and third-party publishers, including new releases like Forza Horizon 4. And it just reached a new milestone in a short amount of time. Microsoft has revealed the full list of game titles that are now available on the service, and it’s reached well over 200 at the moment. These include a number of Xbox One releases, as well as various backward compatible Xbox 360 games, such as Alien Hominid, the Banjo Kazooie games and various others. The full list can be found here. 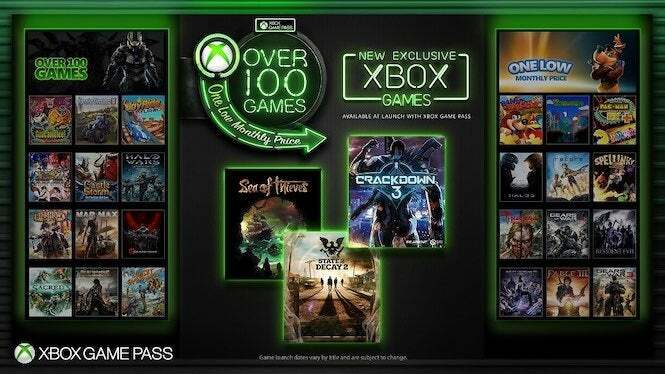 Considering that the service was originally set to offer just over 100 titles a month, this is a huge feat for Microsoft; and it’s one they’re likely to continue building upon since they just announced a batch of games coming to the service, including the Ori side-scrolling adventures and Crackdown 3, which is set to debut on the service day and date with its official release on February 15. The service has seen a huge boost in users since it launched a while back, particularly when Microsoft started introducing new releases to it, including Sea of Thieves and State of Decay 2. That has turned out to be quite a value in itself, introducing fans to potential new games for their library, while at the same time letting them also enjoy classics. Microsoft has made the Game Pass service a focal point in a number of its system bundles, as well as part of its All Access program, where you can purchase an Xbox One or Xbox One X console with Xbox Live Gold and Game Pass included, practically giving you a nice package deal for just a few bucks a month. And more than likely, we’ll continue to see that focus in 2019, especially with Microsoft on the verge of potentially introducing a new system without a disc drive. No doubt Xbox Game Pass would be beneficial to these players. Xbox Game Pass is available now for Xbox One and Xbox One X.